Lenovo Yoga A940 Desktop Laptop comes with Windows 10 Home Operating System, 8th Generation Intel Core i7-8700 processor 8th Generation Processor ticking at up to 4.0GHz with Turbo Boost clock rate, 8GB, 16GB, or 32GB DDR4 Memory and up to 128GB, 256GB, or 512GB PCIe SSD; or 1TB or 2TB SATA HDD internal storage. 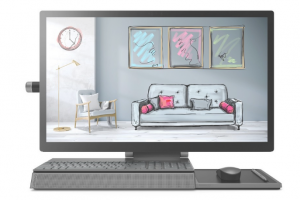 Lenovo Yoga A940 Desktop Laptop also has DTS Sound,Integrated stereo speakers, Lenovo True Vision web cam, Microphone, Full-size island-style keyboard with numeric keypad. The Laptop has 27.0 inch screen size, 25.03 x 18.71 x 8.96 inches (635.7 x 475.3 x 227.7 mm) Physical Dimension and 32.19 lbs. (14.6 kg) weight and Li-ion battery. The Lenovo Yoga A940 Notebook Laptop will start Expected Price 2350$ in USA when it launches within the next few Monthe Expected 2019.